Classic Shell • View topic - Skin with glyph icons in column 2 to match Win10 taskbar? Skin with glyph icons in column 2 to match Win10 taskbar? Post subject: Skin with glyph icons in column 2 to match Win10 taskbar? I note from the docs that it is possible to set some icons, such as All Programs. Is it possible to set any of the other icons which the user can make available, such as This PC, Documents, Control Panel etc? Post subject: Re: Is it possible to set the icons in column 2? 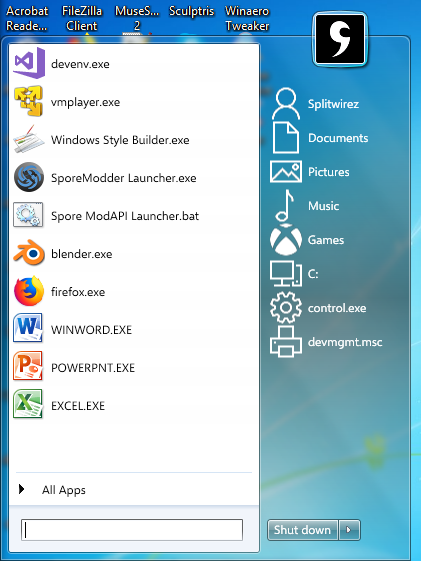 Icons can be customized in any Start Menu style from the Settings UI. Go to the Customize Start Menu tab in Start Menu Settings and double click the icon to bring up the Edit Menu Item dialog. However, for the right-side column, only the "Classic with two columns" style will show icons (when "No icons in the second column" is unchecked from the Skin tab). 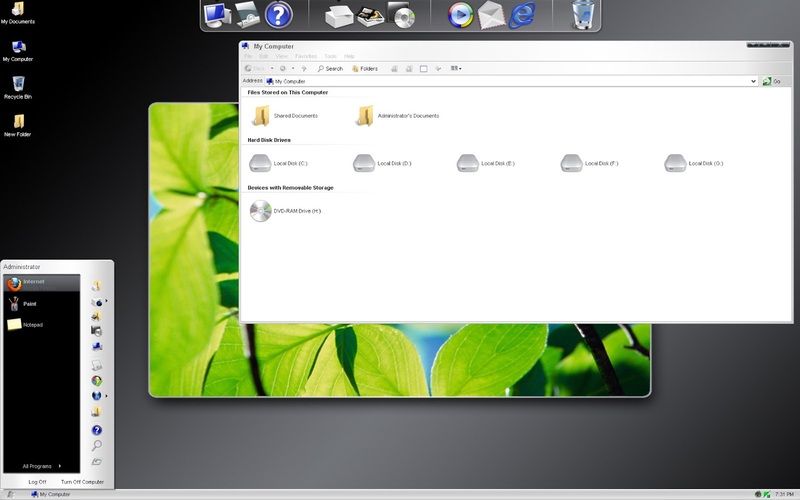 For the Windows 7 style, the right-side column icons will show at the top where the user picture is. Looks like icon customisations are also saved to the settings backup, which is great. My plan is to replace all the stock item icons with Windows 10 equivalents. I can do this myself as you've suggested, but do you know if it's at all possible to change the defaults, so each time I add a new item to the menu, its icon is pre-set? No the default icons are obtained from the item itself. What do you mean by Windows 10 equivalent icons and where did you get them? Are the glyphs used in the left side of the Windows 10 Start Menu stored in some DLL? If you could share them here after you convert them in ICO format, it will be appreciated. Here's how the icons look in-situ. Not as sharp as the core Windows 10 icons, but certainly look more in-keeping with the OS. I think these look much better. Fantastic job. Your own icons are much better. Can we download them? I'm just finishing off a few things, then I'll stick the whole lot on GitHub. You don't happen to know if there's a variable (for use in Customize Start Menu bitmap paths) to directly reference the Classic Shell folder do you? I have CS installed in "Program Files/Utilities/Classic Shell" so it would more user-friendly to be able to distribute a settings.xml file with something like "%PROGRAM_FOLDER%/Windows 10 Icons/someicon.ico" rather than my path, and some notes in the readme for people to edit this before installing. Yep some folder inside %localappdata%\ClassicShell is a good idea since %ProgramFiles% is UAC protected. OK, everything is uploaded to Github. If you'd like to check it out and give me any feedback, that would be great. What's the best way to announce a new skin? Is there a thread for this kind of thing, or do I just make a new one? You could edit the first post of this thread if you want, change the title or create a new thread. If possible add some screenshots with a generic user picture so I can post about it on the Facebook page. Edit: Downloaded. Nice icons. We still need glyph icons for Music, Videos, Downloads, Apps, Games, Monitor off, Default Programs, Recycle Bin, Programs and Features, WiFi, Recent/Frequent folders, if anyone else wants to pitch in. And high res/high DPI icons (64x64 or higher) for all items. Really behind on work at the moment anyway, so this will all probably be a couple of weeks away! Weirdly, I've just tried to install the skin on a 2nd computer, and Classic Shell doesn't see it. I've downloaded it from my Github repo, as well as copying the actual .skin file, and it's the same each time - no skin shows in the list. The skin opens in Resource Hacker on that machine too. Both machines are running Classic Shell 4.2.4. OK, I figured it. The default setting were on "Windows 7 style" and I don't have a .skin7 file. Thanks to davestewart's awesome work, my Start Menu looks very native on the crappy Windows 10. Not that I would leave Windows 7 for it or anything but still. I've set up a bunch of different Start Menu configurations which I'll be uploading for the next release, hopefully with an expanded icon set, and even more hopefully 16px and 48px icons. It's so much nicer having a Start Menu that behaves like Windows XP, but feels like Windows 10, I'm really glad you're enjoying it! where can i download it? does it work with the last version of classic menu? Click the "Clone or download" button -> Download ZIP. It's inside the ZIP -> Dist folder. about your skin where can i get it ? Well it's not the same exactly but instead of using icons, if you use Unicode text symbols, you can have some glyphs in Windows 7-style, 2nd column as well. If in the future, Ivo can add support for color fonts which are supported using DirectWrite on Windows 8.1 and Windows 10, we can have full color emojis. Then fonts like Segoe UI Symbol or Segoe UI Emoji can be used. Note: These glyphs will display properly on Windows 7 and up with the Segoe UI Symbol font present. You might want to change the font used in your skin(s) to Segoe UI Symbol. The rest of the non-glyph characters should display the same as regular Segoe UI. Hi, I'm just putting a test 7 style opaque skin here, and not really expecting any feedback at this late stage. But hey, if Gaurav is still around to answer questions when on Windows 10, would be great, but I know Gaurav and many people are not happy about Win 10, and may not even be using it. Putting the .skin7 in skins folder and loading the xml file will put glyph symbols in the second column. The font used is Windows 10 "Segoe MDL2 Assets". The biggest problem is the symbol is too high up making the y and g text get cut off at the bottom. and then normal "Segoe UI" for the text? If no response, no problem. I put as a request over on GitHub. Ok, this is weird. Classic Shell is just following what Windows 10 is offering! even the g,p,y,q tails are cut off as well. 1. Windows 10 1809 has a bug for showing this MDL2 fonts text. I really don't want to go back to an earlier version to find out if true. which does not line up correctly with the glyph element? Maybe uses "Segoe UI Symbol" as a fallback? OK, I'm stuck in the mud again. I went back to my old Windows 8.1 harddrive. Downloaded, and installed earlier version 1.55 Segoe mdl2 assets.ttf font. but still has the same problem with the text tails cut off. Here is the 7 style Metro test skin for glyphs with the Symbol or MDL2 font text setup in skin file. Can load xml file for the font like one from Gaurav, or load the one like Startisback. Read the note Glyph 'Readmet' inside zip to see issues. No cures, unless all text is in CAPITALS to avoid the cutoff. one can just have the glyphs on the second column. Now, where have I seen that look before? Heh...reminds me of a few old XP themes which pulled a similar trick. Was this kind of thing what you were referring to about having seen "that look" somewhere before? Yes, there were a lot of xp themes like that. Can do similar on CSM classic 2 style. are now on the right side of the Classic Shell menu. Like a mirror. Is it too big of a project? Steam won't let me play all my old games (eg, Serious Sam) on XP anymore. and put on Windows 10 instead. Bye, bye XP. It was nice using os for all these years. Last edited by juniper7 on Sat Dec 08, 2018 9:03 pm, edited 1 time in total. The recent insider version introduces clipboard history support. (IE you can get that text you copied 10 minutes ago. it even syncs across devices, so you can ctrl+C on desktop and ctrl+v on laptop. (very convenient) however Afaik it doesnt work with files yet. I tried some of those new apps that install themselves. Not really for me, but keep em coming coz I like to see what apps are capable of. I've never been forced games like Candy Crush Soda Saga. Maybe that only happens with Home version? I had to download from Windows store. Once I played it, found out it's the same as older games 5 to 10 years ago. Uninstalled it- It never reinstalled. That multi clipboard feature looks like it could come in handy every once in a while. but needed to copy something else before pasting initial one, and the first got overwritten. It's a good safety feature, so I enabled it on 1809. Personally I use rainmeter with a clipboard plugin; but I am keeping an eye on it. if they ever include file support It will be amazing. Instead of copying a backup of a .dll to your desktop before replacing it. you could simply cut it. then throw the new one in its place, without having to worry about accidentally overwriting the clipboard. Just for fun, I used a trick from meetHG, to make a closer look to the default Win 10 start menu ( not the tiles part). I'm not uploading the modified skin/xml files, because it does not fully work. Only wanted to see how far I could go. forcing the second column to show before the first column. I changed the other menu views paddings a little as well. The search, programs, and jumplist views work correctly. is it makes all the padding zero on the top/left. So there is no free space around its selector button. The user picture shows mostly off the screen. It only worked at 100% size. Would need further work for HDPI size. I actually like it better when the 2nd column is on the right, so flyout menus don't overlap the main menu. So, I'll leave it at that. I wouldn't say that...we're making progress. Slowly, but surely, we're making progress. I doubt the moderators on here are going to ban us at this late stage for an alternative start menu picture or ten. you posted that you would like to use the Windows 10 glyphs on your Start9. Entice us with at least one screenshot of a Start9 skin using glyphs, along with text that has its tails not cut off. That was back when Start9 was just a Start Menu replacement. That having been said, I may still look into it, but honestly...I don't even know. It might make more sense to go for XAML or SVG or something at this point, given what we're dealing with now. ...also idk about your approach, but mine should work on Windows 7 and 8.1 as well as 10, since they're not dependent on the actual Segoe MDL2 Assets font itself. JK, Its never really been against the rules unless its blatant advertisements of an unrelated product. I would very much consider start9 related as it shares inspiration with classic shell; and features for one are generally relevant to the other. Trying to sell shoes on amazon? yea thats against the rules. but not linking to anything Windows/UI related. Yeah, I was horsing around with the banned comment. I think before CS went public. More pictures, gifs, vids, please. Dang it. I did not say exactly "Segoe MDL2 Assets" font. Looking at the pictures glyph, it is not the same as the original. FontIcon <FontIcon FontFamily="Segoe MDL2 Assets" Glyph="&#xEB9F;"
Can the glyph size in your screenshot be changed easily apart from the text size? Using Gaurav's approach, the font name and its size have to be put in the skin file. If on earlier Windows, the Segoe MDL2 Assets font has to be downloaded and installed in font folder to work. You won ...... the satisfaction of making me supremely jealous. My apologies, I guess I misunderstood the challenge. Sorry about that. Not so here - Start9's icon override feature supports PNG icons, and ICO, SVG, and XAML are all on my list to look into. You've got me tempted to look into fonts as well, although until I do some research into the legality of embedding that font, I doubt I'll be using it as an example. Good thing this is all open-source.